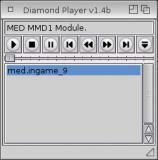 Welcome to Diamond Player, a MED MMD0/MMD1 and Protracker MOD replayer. This is a major cleanup release with few bug fixes. No new features in this version nor new music formats handled. This version requires AISS package to be installed! you run the program you will be asked to choose AHI Audio Mode. Below the buttons there is status bar and the playlist. select its name in the playlist and hit Play button. modules will be used as default. just remove AUDIOID= ToolType from the icon. v1.2b - Protracker replayer rewritten so it fits very well to original one now. Additionally some fixes were done to playing functions aswell. v1.2a - Supports almost all Protracker MOD effects with good accuracy. Configuration saved in tooltypes of icon. v1.1  - Added simply and comfortable GUI. - Supports MED MMD1 and Protracker modules. - More music formats handled.